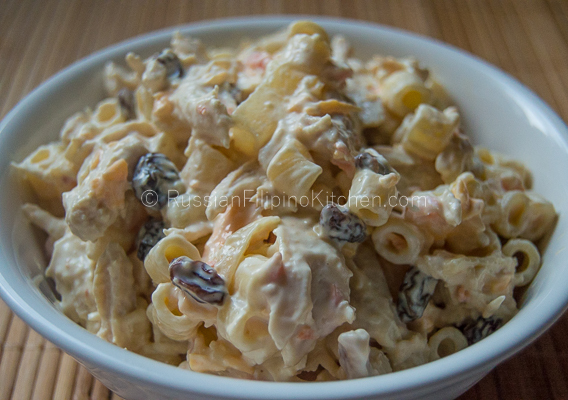 This Filipino version of chicken macaroni salad is creamy with just the right amount of sweetness. 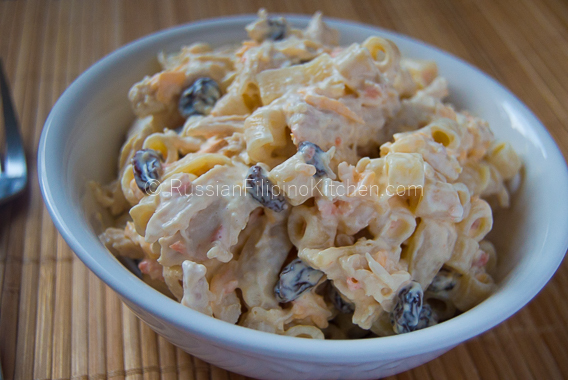 This type of salad is served as a dessert rather than as a side dish in Philippines, and is mostly present at the table during special occasions like birthdays, Christmas, New Year’s, including fiestas. 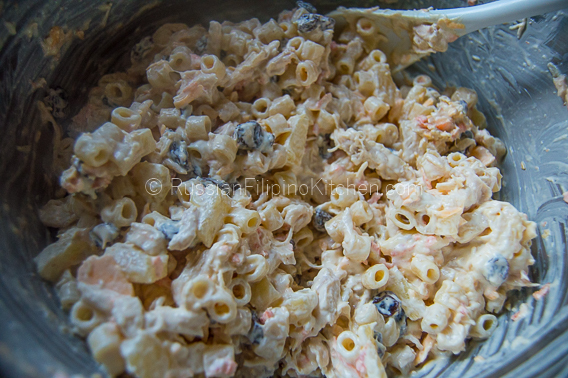 Being a Filipino and one that is accustomed to Pinoy foods, this is one of my ultimate favorites in the “sweet salad” category. Every time I make this, I don’t eat it just for desserts but also as snack, lunch, and dinner. It’s one delicious dish I can’t resist! Anyway, because the sweet taste is minimal, this will make a great side dish for grilled or barbecued beef, chicken or pork. Enjoy! 1. Place chicken breasts in a sauce pan. Add water enough to cover meat and throw in ½ teaspoon salt. 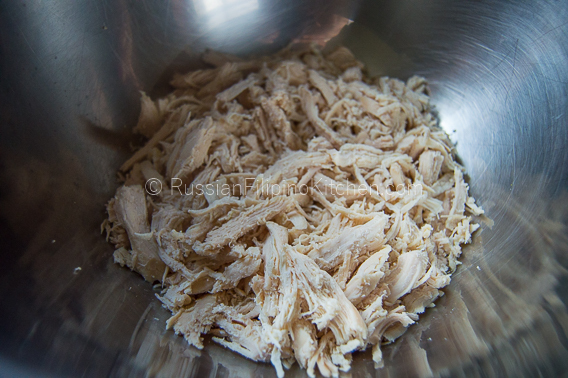 Bring to a boil and lower heat to medium low and simmer for 30 minutes until chicken is thoroughly cooked. Remove from heat, drain, and set aside to cool. Shred into tiny pieces and place in a large mixing bowl. 2. (can be done simultaneously with step 1) Fill another sauce pan with 5 cups water, add ½ teaspoon salt and bring to a boil. Add pasta and cook until al dente (just right, which means neither hard nor soggy), stirring occasionally about 6-7 minutes. 3. Drain pasta and rinse under cold running water. Rinsing removes the starch that causes pasta to stick to each other. Also, it cools them much faster. 4. Drain pineapple tidbits, removing most of the juice. 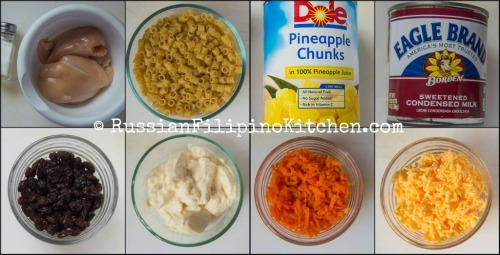 I’m using pineapple chunks so I have to chop them into smaller pieces. 5. Throw everything into the mixing bowl and mix thoroughly. 6. Refrigerate for at least an hour before serving. Place chicken breasts in a sauce pan. Add water enough to cover meat and throw in ½ teaspoon salt. 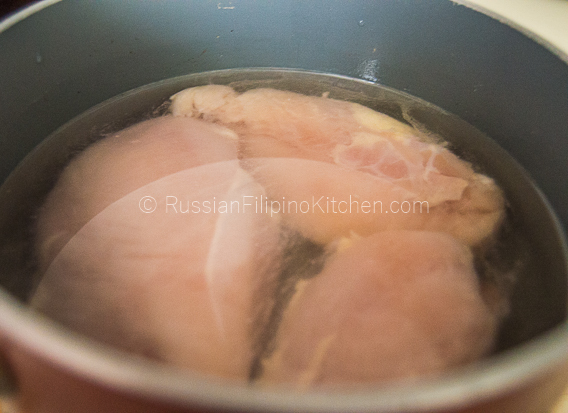 Bring to a boil and lower heat to medium low and simmer for 30 minutes until chicken is thoroughly cooked. Remove from heat, drain, and set aside to cool. Shred into tiny pieces and place in a large mixing bowl. 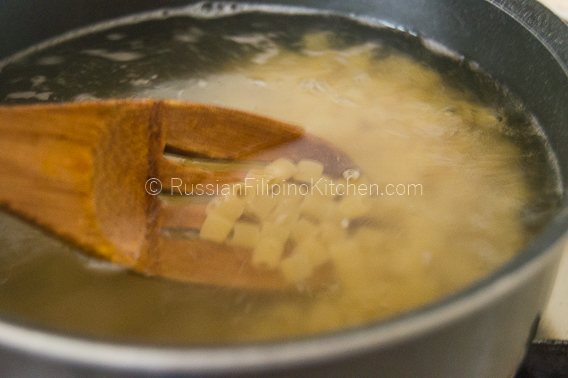 (can be done simultaneously with step 1) Fill another sauce pan with 5 cups water, add ½ teaspoon salt and bring to a boil. Add pasta and cook until al dente (just right, which means neither hard nor soggy), stirring occasionally about 6-7 minutes. Drain pasta and rinse under cold running water. 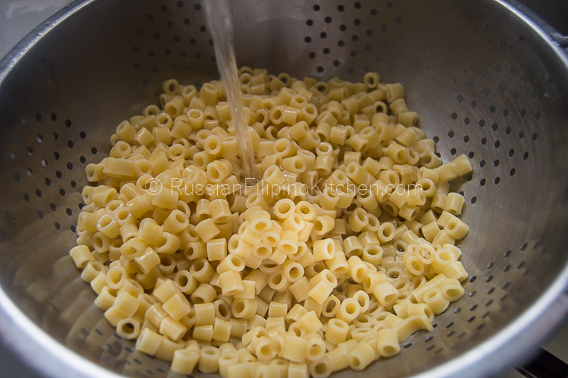 Rinsing removes the starch that causes pasta to stick to each other. Also, it cools them much faster. Drain pineapple tidbits, removing most of the juice. 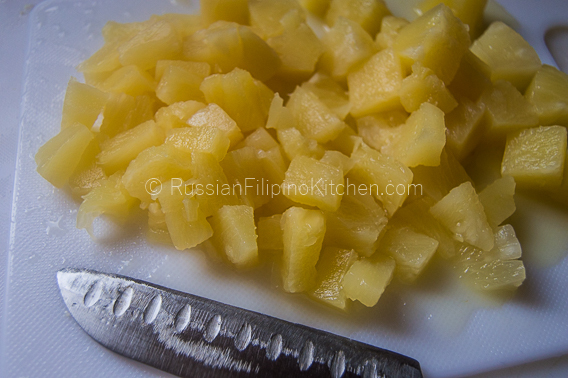 I’m using pineapple chunks so I have to chop them into smaller pieces. Throw everything into the mixing bowl and mix thoroughly.